In many countries patient involvement is high on the healthcare policy agenda, which includes patient representation in collective decision-making. Patient organizations are generally considered to be important representatives of patients. Other actors also claim to represent patients in decision-making, such as politicians, healthcare professionals and client advisory councils. In this paper we take a broad view of patient representation, examining all the actors claiming to represent patients in the Dutch debate on the decentralization of care. We conclude that variety in forms of representation could help do justice to the variety of patient preferences. 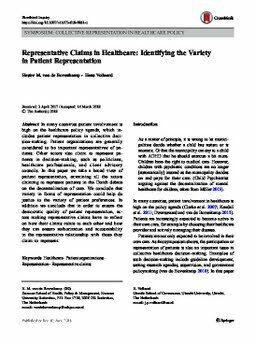 In addition we conclude that in order to ensure the democratic quality of patient representation, actors making representative claims have to reflect on how their claims relate to each other and how they can ensure authorization and accountability in the representative relationship with those they claim to represent.